Because Juan, Dan, Pablo & Miguel are so well adjusted, it’s been hard for our visitors to believe that they’ve only been at the Home for a few months! It was just this March that Mrs. Alvarez was brought to the Home by a local pastor. She broke down in tears immediately, as she began to tell us her story, that of a a modern Mary Magdalene. 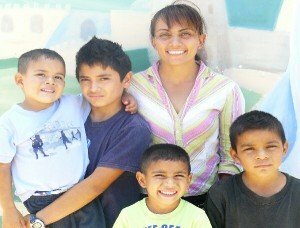 Now, seeking to live a life that would please God, she des pertly needed a secure place to leave her 4 young sons ages four to twelve. It was evident how ashamed she was, over the life she had been living and the ungodly things her sons had witnessed. You could tell that her heart was torn over the thought of being separated from her boys; but at the same time, she was so profoundly grateful to know a Home like ours existed; and that she could take some time to get back on the right path. Today, to merely say the boys are doing well, would be an under-statement; thriving is more like it! Juan is the classic, slightly over protective, older brother; Dan is Mr. Personality; Pablo is the comedian and Miguelito is our little sweetheart. without you, our faithful supporters it wouldn’t be possible!